The Asia-Africa Growth Corridor (AAGC) is a collaborative vision shared by India and Japan to create a growth corridor and industrial network connecting Northeast Asia, Southeast Asia, South Asia and Africa across the Indo-Pacific region. 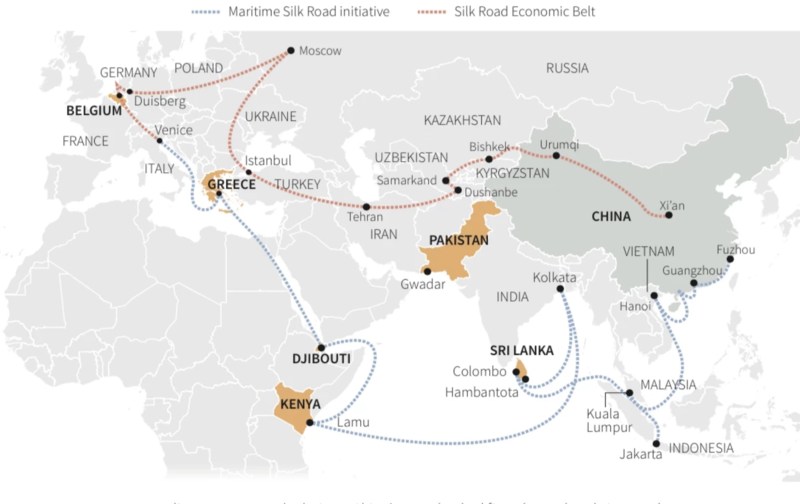 It has been seen as being aimed at “countering the Belt and Road (the Silk Road Economic Belt and the 21st Century Maritime Silk Road Initiative),” as there is a high level of overlapping in geographic coverage and cooperation fields between the AAGC and the Belt and Road Initiative. Indian Prime Minister Narendra Modi has declared that India and Japan would jointly develop an Asia-Africa Growth Corridor and a vision document of the Asia-Africa Growth Corridor Partnership for Sustainable and Innovative Development was drawn up. In the document, it is pointed out that the AAGC will be instrumental in creating new production channels, expanding and deepening existing value chains, ensuring economic and technical cooperation for enhancing capacities, facilitating a greater flow of people between the two continents, and achieving sustainable growth over the longer term. The AAGC will be developed through quality infrastructure and complemented by digital and regulatory connectivity. Geographically, the AAGC covers the Indo-Pacific region, with special emphasis on “Maritime Asia” and Africa. The AAGC claims to promote integration between Asia and Africa across the Pacific and Indian Oceans. Judging from the present situation, Maritime Asia and Africa are the priority areas for Japan and India in their efforts to build the AAGC. Maritime Asia refers to the maritime region extending from Northeast Asia, across Southeast Asia and South Asia to West Asia. With the growing importance of sea-lane security in these regions, which seem to have become more vulnerable, Japan and India’s maritime security concerns have increased, leading them to enhance maritime security cooperation. Although there is not much about Maritime Asia in the Vision Document, it is indeed the key field for these two countries’ strategic coordination. Since the Vision Document was released, cooperation between the two countries has further deepened: for one thing, the progress China has made in port and pier building in Maritime Asia has intensified India’s worries about China’s so-called String of Pearls strategy, while Japan also fears that China will jeopardize the maritime order. The two countries believe it is a must for them to jointly act to counter China’s “dominance”. Africa is another key area for the AAGC. In the Vision Document, many development and cooperation programs focus on Africa, specifically arguing for the complementarity of India and Japan in Africa. Although the United States considers the Indo-Pacific region as stretching from the west coast of India to the western shores of the United States, according to Japan and India, Africa (especially East Africa) should also be included as part of the Indo-Pacific region. The Vision Document outlines four pillars for the AAGC. These are development and cooperation projects, quality infrastructure and institutional connectivity, enhancing capacity and skills, and people-to-people partnerships. The reason people-to-people partnerships are a key field are because emphasizing t these interactions makes it easy to claim the moral high ground and ease other countries’ worries. People-to-people partnerships are also consistent with the respective economic development strategies of Japan and India, who would benefit from the AAGC. And because these partnerships echo the United Nations’ 2030 Agenda for Sustainable Development and Agenda 2063 of the African Union, they help to gain more support for the AAGC. People-to-people exchanges include tourism, education, and knowledge promotion. The AAGC is the outcome of a transition of Japan and India’s domestic policies. Also, it has emerged from these two countries’ strategies in the Indo-Pacific region, and suits both countries’ interests by tapping their complementarity, and jointly exploring the opportunities presented by Africa’s development. This AACG initiative also embodies their worries about China’s Belt and Road Initiative and China’s striving to be a maritime power. The strategic understanding between Japan and India has been upgraded to strategic coordination, which can be clearly observed from the AAGC. In recent years, it has become a strategic consensus that the Indian Ocean and the Pacific Ocean have turned into one integrated zone with geopolitical significance. As two important powers in the Indo-Pacific region, Japan and India have been steadily enlarging their bilateral cooperation under the Indo-Pacific framework, and they have even actively planned for multilateral cooperation with the United States and Australia. Despite the various obstacles that lie ahead, the AAGC is bound to advance in the long term and impact on China’s Belt and Road Initiative to a certain extent. As concerns about China are an important driver of the AAGC, the advance of the initiative will inevitably have competitive effects on China. Despite China’s reiterations that it is committed to a path of peaceful development, as well as its commitment to fostering a new type of international relations and building a community with a shared future for mankind, which was delivered at the 19th CPC National Congress, the Japanese and Indian governments have not given any positive response. The perception of China challenging the existing international order has become a strategic consensus for the two countries. Therefore, the AAGC, which provides an alternative to the Belt and Road, will not be easily abandoned by the two countries. While the AAGC is likely to collide with some Belt and Road projects in its implementation, the possibility of cooperation between the AAGC and the Belt and Road Initiative cannot be simply ruled out. First, the geographical coverage and the scope of the two initiatives largely overlap. The possibility exists for China, Japan and India to jointly advance some development projects, especially in low-sensitivity areas that concern people’s livelihoods, such as agriculture, medicine and disaster relief. Second, without appropriate guidance, the competition or even antagonism between the two initiatives is not in the interests of either side. The AAGC is becoming a major pivot for Japan-India strategic cooperation in Asia and Africa. Looking at the diplomatic adjustments of the two countries in recent years, the AAGC is far from simply an economic initiative, but a specific reflection of strengthened bilateral strategic coordination in the region. Even though the specific planning for the AAGC has not yet been unveiled, and despite the multiple risks and challenges its implementation might encounter, the two countries’ determination to advance the initiative is clear. While the competitive effects of the Asia-Africa Growth Corridor on the Belt and Road should not be underestimated, China should avoid a zero-sum mentality. On the contrary, it is necessary for China to closely follow the progress of the AAGC, so it can more actively enhance its policy communication to Japan and India, publicly voice its own concerns, and explore the possibility of cooperation between the Asia-Africa Growth Corridor and the Belt and Road Initiative. 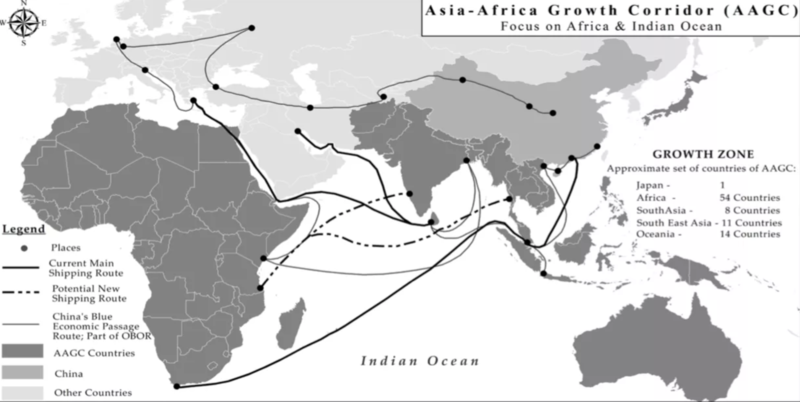 The Asia-Africa Growth Corridor: Content, Motivation and Prospects, Lou Chunhao, Associate Research Fellow and Deputy Director of the Institute for Maritime Strategic Studies, China Institutes of Contemporary International Relations (CICIR).